We're delighted to have Alice Pung here to give us the scoop about her novel LUCY AND LINH. Alice, what scene was really hard for you to write and why, and is that the one of which you are most proud? Or is there another scene you particularly love? My favorite scenes to write were the ones of Lucy and her family, especially her baby brother the Lamb. She visits malls with him, buys terrible junk food for him, lets him play in coin-operated shopping-centre rides without putting in coins, but there is great love there. I wanted to show that class and lack of money doesn’t preclude this. How long did you work on LUCY AND LINH? Two years, but I also work as a lawyer, and writing is not my full time career. That it is quite easy for me to recall, with vivid detail, my high school years. They were pivotal in shaping the adult I am today. What do you hope readers will take away from LUCY AND LINH? I did not write this book to be didactic, but I hope readers will read this book and think deeper about issues of class and culture. High school is a bizarre environment where strangers are put together for most of the day, with the only initial thing in common being their age. So of course cliques and groupings form, based on the most superficial criteria. Yet most young adults are insightful, self-reflective and insecure – so high school is a real testing ground for their role in society. I am lucky in that I already had two bestselling non-fiction books and an anthology published in my home country, Australia, and also I have a very wonderful editor who has been my editor for over ten years. So he welcomed my first work of fiction. I have a one year old son, and work three days a week as a legal researcher in the area of minimum wages, so I write when I can, and have not much time to get into any real ‘ritual’ of writing! Like the Nike ad says, Just do it. I find the writers that spend ages talking about writing, about how they have a book in them, never really go through with the hard slog of writing. It’s like training for a marathon – you can’t do that marathon unless you actually get on those shoes and run and run and run. I am editing an anthology of stories by high school students about an important life lesson they’ve learned. I love young adult voices, from teenagers themselves. They are so earnest and imaginative when given the opportunity to be. Alice was born in Footscray, Victoria, a month after her parents Kuan and Kien arrived in Australia. Alice’s father, Kuan - a survivor of Pol Pot’s Khmer Rouge regime - named her after Lewis Carroll’s character because after surviving the Killing Fields, he thought Australia was a Wonderland. Alice is the oldest of four - she has a brother, Alexander, and two sisters, Alison and Alina. Alice grew up in Footscray and Braybrook, and changed high schools five times - almost once every year! These experiences have shaped her as a writer because they taught her how to pay attention to the quiet young adults that others might overlook or miss. Alice Pung’s first book, Unpolished Gem, is an Australian bestseller which won the Australian Book Industry Newcomer of the Year Award and was shortlisted in the Victorian and NSW Premiers’ Literary awards. It was published in the UK and USA in separate editions and has been translated into several languages including Italian, German and Indonesian. Alice’s next book, Her Father’s Daughter, won the Western Australia Premier’s Award for Non-Fiction and was shortlisted for the Victorian and NSW Premiers’ Literary awards and the Queensland Literary Awards. Alice also edited the collection Growing Up Asian in Australia and her writing has appeared in the Monthly, the Age, and The Best Australian Stories and The Best Australian Essays. Alice is a qualified lawyer and still works as a legal researcher in the area of minimum wages and pay equity. She lives with her husband Nick at Janet Clarke Hall, the University of Melbourne, where she is the Artist in Residence. 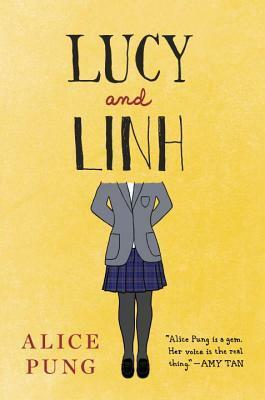 Have you had a chance to read LUCY AND LINH yet? Do you use your high school memories in your writing? Do you spend too much time talking about writing or do you 'Just do it'? Share your thoughts about the interview in the comments!